UMX MiG-15, 28mm EDF Jet BNF Basic with AS3X and SAFE Select. Modellen er udstyret med AS3X stabiliseringssystem og beregnet til at flyve på 2,4 GHz Spektrum DSMX, og kan benyttes med alle sendere der overholder denne standard. Færdigbygget model i skum, med alt udstyr bortset fra sender, batteri LiPo 280mAh-2s og lader for batteri. 4 kanals 2,4 GHz DSMX/AS3X modtager til motor, kræng/højde- og sideror. Completely factory-assembled, the MiG-15 plane is ready to go right out of the box! The MiG-15 jet fighter entered the stage as a complete surprise, boasting incredible performance and heavy-hitting firepower. Its opposition accepted the challenge in under-classed aircraft with only the advantage of superior tactics. It was an ace pilot’s dream scenario. Back by popular demand, the E-flite® UMX™ MiG-15 EDF jet replica returns as an incredible fighter experience that delivers some pleasant surprises such as more power, even smoother handling and optional-use SAFE® Select technology that makes it easier for pilots to enjoy formidable jet performance. 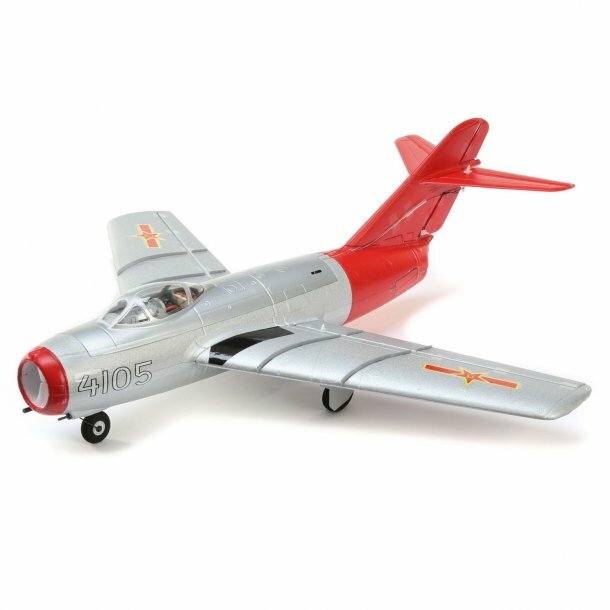 The E-flite® UMX™ MiG-15 EDF jet is a scale replica of the surprise Russian weapon used during the Korean conflict. Based on the popular ultra-micro that introduced the world to the impressive advantages AS3X® technology offers models with an exact scale outline, this upgraded MiG shines with a period inspired paint scheme along with some other surprises. Beyond the intricate surface detail, functional split-rudder, nose wheel steering and removable landing gear is the potent Delta-V® ducted fan system housing a more powerful brushless motor that makes acceleration quicker and top speeds faster. More finely tuned AS3X stabilization makes this nimble dog fighter seem smoother than jets many times larger. Plus, optional-use SAFE® Select technology gives pilots new to flying a high-performance jet revolutionary flight envelope protection that makes getting familiar with a new model feel more comfortable than ever before. This Bind-N-Fly® Basic model features a Spektrum receiver integrated with AS3X® (Artificial Stabilization – 3-aXis) technology that works behind the scenes to smooth out the effects of wind and turbulence to deliver a heightened sense of stability and precision that makes it feel like you're flying a larger, expertly tuned aircraft. If you’re a relatively new pilot or want an extra margin of safety while familiarizing yourself with the airplane, you can enable optional SAFE® Select flight envelope protection technology built into the receiver. Engineered ducting is a painstaking effort that involves careful attention to the high-volume airflow possible with the 28mm Delta-V® 180m EDF system and high-output brushless 13,500Kv motor combination. The result is a model replica with undisturbed scale outlines and the exhilaration a legendary jet fighter should deliver. Independent performance linear long-throw servos, plus AS3X® stability offers smooth flight and precision control. Its scale split-rudder, nose wheel steering, individual elevator pushrods and outstanding roll precision deliver the control authority demanding jet pilots deserve. The UMX MiG-15 model arrives 100% factory-assembled and ready to go right out of the box! It's equipped with industry-leading Spektrum® 2.4GHz technology that binds to your 5+ channel DSMX®/DSM2® equipped transmitter so you can be flying within minutes of opening the box.